The pressure to be a perfect parent raising perfect children –it penetrates every mama’s heart. A merciless critic lives in all of us. A critic that causes us to wonder, “How did these precious children get stuck with a parent like me?” This was a hot topic in my women’s Bible study. So many of our conversations led to our insecurities as mothers and the shame that ensues from feeling like we’re never enough. If there was anything we all agreed on, it was how parenting reveals our greatest weaknesses—how feelings and reactions we were once only casually acquainted with (like anger, impatience, powerlessness, and utter defeat) suddenly became our closest friends when we became parents. And what do we do with that shame? We get right back to doing more and trying harder to make ourselves and our children look a little more perfect. Because deep down we fear something that is so hard to confess - we fear that a little more perfect means a little more lovable. Lovable. Isn’t that the one thing we all really crave? To feel lovable ~ in all of our imperfection. An identity anchored in Christ’s perfection, not our own. God’s undeserved and unconditional love, on our best and worst days. Grace. And when we refuse to receive and enjoy God’s grace for our own weakness and failures, we end up placing the same crushing burden on our children. I know, because I was that mom. To lay bare my own battle with perfection and the God who set me free. To show how His grace equips us, in very practical and simple ways, to raise children who know they are fully known, fully accepted, and fully loved by God. To show how can we raise children who know that God loves every part of them - the best and the worst parts, the beautiful and the ugly parts. The parts they want to shine and the parts they want to hide. All of those parts that are wrapped up into these little wonderfully and perfectly made children. To show how we can anchor their identity in being a beloved child of God, and help them grow in a very real and exciting friendship with Jesus. Oh, and that goes for you too, mom. God loves all of you. On your best mama days God is not applauding for you, and on your worst mama days God is not shaking His head in disappointment at you. I really want us to own this truth because if you’re anything like me, parenting makes you a little weary, and you’re pretty sure on most days you aren’t qualified for the job. This is the beauty in parenting a wholehearted child—It isn’t about getting it right all of the time. If it were, I would have given up a long time ago. Rather, it’s about saying, “Me too. I struggle too. I get it wrong too. Thank God for Jesus who loves to forgive us.” I can be vulnerable with my kids when I get it wrong because I know that Christ covers all of my mistakes and His strength is made perfect in my weakness. (2 Cor 12:9) And this gives permission to my kids to also be real with their mistakes and weaknesses—to feel fully known and fully lovable, in all of their imperfection. So we can proceed with hope because what we get right and what we get wrong is not what will ultimately determine who our children become. God’s grace is bigger than all of our mistakes. Let’s start the journey now to making the GRACE of God the foundation for how we lead and love our kids. 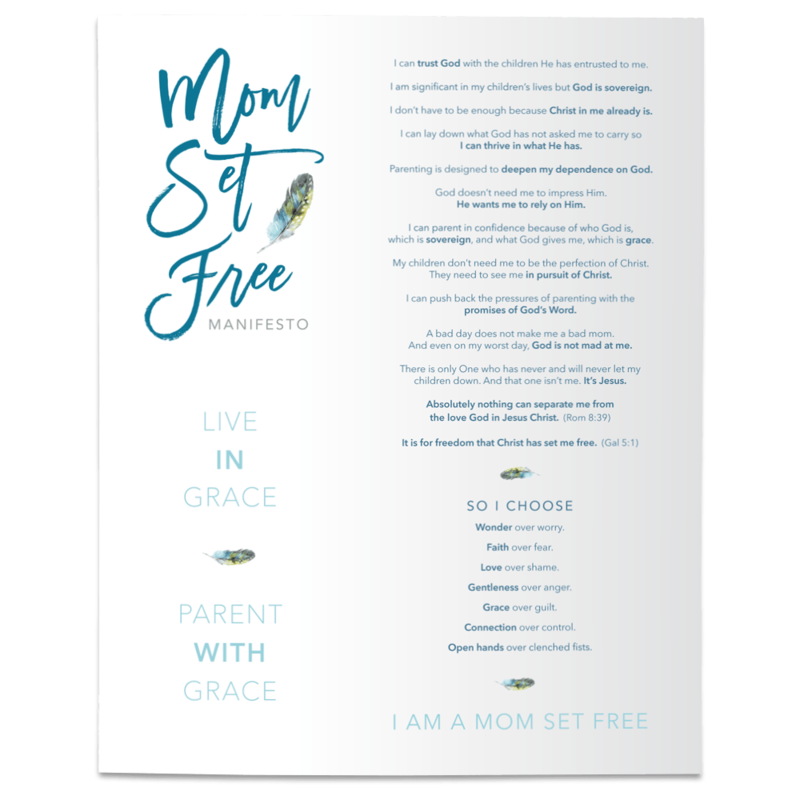 I am so excited to go on this journey with you ~ This journey that is breaking the shackles of unreasonable expectations in our family and teaching us to live more fully in the messy reality of life with littles. I can’t wait to share it with you ~ How the knowledge and experience of His love and His acceptance of us, as flawed and exhausted parents, radically changes the love and acceptance we are able to give to our children. How it’s not your perfect performance as a parent, but God’s perfect love in Jesus Christ, that will satisfy every longing in your child's heart. * Please share this post!! Use any (or all!) of the social media buttons below to share this post with your friends!